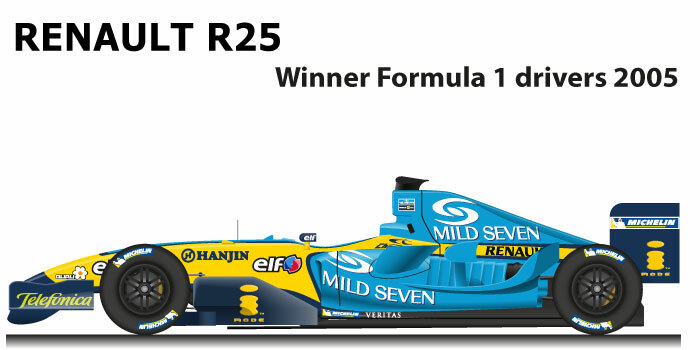 The Renault R25 n.5 is the winning car of the Formula 1 World Championship in 2005. The French car was designed by Bob Bell and Mark Smith, the management of the team was entrusted to Flavio Briatore who thanks to the contribution of the transalpine manufacturer brought in team the young Spanish talent Fernando Alonso. Alonso with the Renault R25 n.5 won the Formula 1 World Championship drivers title in 2005. For the Spanish driver and for the French team it was the first title. The Spaniard at the beginning of the season proved himself determined, and thanks to the three victories in a row in Malaysia, Bahrain and San Marino took a large margin that he managed throughout the season, consolidating it with the victories in the Grand Prix of Europe, France, Germany and China . Thanks to the points won by the second pilot of the team, Giancarlo Fisichella, Renault won the constructors’ title.